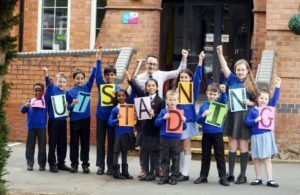 Children and staff at a Coventry school are celebrating after being hailed Outstanding for a second consecutive time. 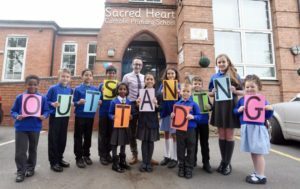 Sacred Heart Catholic Primary School, in Brays Lane, has been given the top grading from Ofsted inspectors. The rating was celebrated with a non-uniform day where everyone was treated to ice creams and a bouncy castle. The school, which is part of the Romero Catholic Academy, was judged to be Outstanding in all areas including outcomes for pupils; teaching, learning and assessment; personal development, behaviour and welfare as well as leadership and management. The report refers to Principal Paul Madia as ‘inspirational’ and says that there are high-quality processes in place to continually improve teaching and excellent training for new leaders. Parents are described as having ‘unwavering’ praise for the staff and leadership, commenting to inspectors that ‘the school is superb’ and ‘the teaching is strong’. The pupils themselves are also described as a credit to the school, with the report stating that they are ‘polite, well-mannered and mature’ and that their ‘work ethic in lessons is terrific’. Paul Madia said: “We are extremely proud to be rated as Outstanding for the second consecutive time. “We have been through a number of Ofsted framework changes and each time the bar has been raised making it even harder to achieve outstanding, which makes the outcome of our latest inspection even more rewarding. “The report praises everyone from across the school, including our incredible staff and senior leadership team, our Local Academy Committee and of course our excellent children. “We are a united team working towards the same goal, and at the end of the day it’s all about the children so we are delighted to provide them with a school they can be proud of. “Myself and Executive Principal Helen Quinn would like to thank everyone for their support in helping us achieve this Outstanding success. “One of the school’s main strap lines is where memories are made – so of course we celebrated in style by holding a non-uniform day where we had a bouncy castle and a visit from an ice cream van. Next A major new BBC2 factual history series seeks secondary school teachers… could they include you?